In a private room at Airshow China set aside for discreet deal making, the Commercial Aviation Corporation of China has hung a picture of President Xi Jinping sitting in the cockpit of one of its new planes. The glossy photo is more than just a celebrity endorsement: It represents the status of the company, known as Comac, as the country’s largest foray into commercial aviation. And Comac has ambitions to push beyond the borders of China, facing off directly with Western heavyweights in a global market that by some estimates is expected to see more than $4 trillion in sales over the next 20 years. At the air show, Comac’s two biggest projects, the ARJ21 regional jet and the C919 jetliner, are front and centre — although the C919 has yet to make its first flight. And even though Comac has many obstacles to surmount, the competition is paying attention. Marwan Lahoud, the head of strategy and marketing for the European plane maker Airbus Group, said he expected to see Comac going head-to-head with Airbus and its American rival Boeing for airline orders by the beginning of the next decade. On Tuesday, the first day of the air show, Comac announced a deal to build 30 C919 jets, which can carry about 170 passengers, for the leasing arm of the state-owned China Merchants Bank. Comac, founded in 2008 in Shanghai, is also state owned. Neither the total value of the deal nor the unit price was disclosed. “Manufacturers love to announce big orders — they tend to do a lot of negotiations prior to an air show and save up the news to announce” before a global audience, said Ray Jaworowski, a senior aerospace analyst at Forecast International. At the Zhuhai show, he said, Comac will “primarily focus on orders from Chinese clients,” who face political pressure to buy domestically produced hardware. Although the C919’s development has hit delays, which are common in the industry, Comac has outstanding orders from several Chinese carriers, including Shanghai Airlines, Xiamen Airlines and Henan Airlines, and one foreign carrier, Lao Airlines. Both the C919 and the ARJ21 rely heavily on Western technology for engines and electronics, with suppliers including General Electric, Honeywell, Kidde and Rockwell Collins. Concerns about China’s engine technology have also hampered military aerospace development in the country. China’s large internal market should ease Comac’s path in attracting early customers and establishing a track record. But even if the planes perform well in the domestic market, to sell them outside China, Comac will face technical, regulatory and political challenges. Certification can involve compliance checks with hundreds, or even thousands, of regulations. Matters as varied as the design of the aircraft, the manufacturing facilities and the onboard systems must meet the agencies’ standards. The process can take years: F.A.A. employees logged more than 200,000 hours on technical certification for Boeing’s 787 Dreamliner, plus more than 4,000 hours of flight testing. In the short term, Mr. Jaworowski said, inertia will favour longstanding plane makers. A new Boeing 737 costs $78 million to $113 million, depending on the model, while an Airbus A320 runs $88 million to $97 million. Both types are proven and in wide use around the world. Boeing estimates the global passenger and cargo aircraft market will be worth $5.2 trillion over the next 20 years; Airbus puts the number at $4.6 trillion. Robert C. Michelson, principal research engineer emeritus at the Georgia Tech Research Institute, said skepticism was warranted about Comac’s plans to sell abroad. The ARJ21 can seat up to 90 and would compete with regional jet offerings from Embraer of Brazil and Bombardier of Canada, among others. It has been in development since 2002, according to Aviation Week magazine, with the first work being done by a government-led consortium that became part of Comac. It was supposed to have entered service in 2007, but that milestone is now expected in 2015. It has not been certified by the F.A.A., and no official unit cost has been publicized. For the C919 jetliner, Mr. Michelson predicts a wide market if Comac can allay concerns about quality, reliability and safety. Mr. Lahoud, the Airbus executive, said the C919’s design would be akin to something built in the 1980s, with a few exceptions. “This may be considered as a weakness if we look specifically at some of the key factors, like fuel consumption,” he said. But he noted that the C919 would be the first aircraft to be fitted with a new generation of engines developed by CFM, a joint venture between Safran of France and General Electric of the United States, that is 15 percent more fuel-efficient than the engines on the current Boeing 737 and Airbus A320 models. Another manufacturer at Airshow China is Gulfstream, the American maker of business jets. 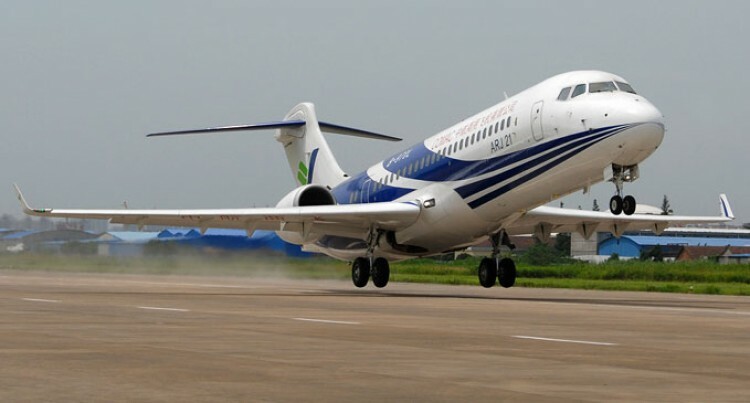 The company, which has 65 percent of the business jet market in China, delivered its first plane to the country in 2003 and now has more than 150 aircraft in operation in greater China. The ambitions of Chinese businesses are taking them outside China, including to Southeast Asia and Africa, and that has helped drive growth in business jet sales, experts say. “We’ve really seen most of this growth in just the last five to eight years,” Steve Cass, vice president for corporate communications at Gulfstream, said as he stood beside two jets showcased on the tarmac at Zhuhai. In the past, 80 percent of Gulfstream’s business was in the United States, Mr. Cass said, but today 50 percent of outstanding orders are international. The largest international market is the Asia-Pacific region.